Sometimes the decisions of the FIA seem totally illogical to me. Take the matter of wheel fairings for instance. It is quite clear that they were accepted as legal because Ferrari were the first to run them and had the unlikely excuse of "brake cooling" to back up the idea. But we all know that their primary function is aerodynamic; this is openly admitted by Toyota's Pascal Vasselon in an Autosport article on the subject today. "You are playing with the front wheel wake, it's not only a drag reduction item," he said. "It's not just something that you put on the car." So why does the FIA turn a blind eye on the innovation, in total contrast to their dubious decision that mass dampers serve an aerodynamic function? Is it really just that Ferrari are the originators? I can see no other possible explanation. Only three teams were able to get a grip on the impact of the fairings during the 2007 season and run them. With changes needed to aero and front uprights, it was no easy matter getting from concept to track. Williams, for example, had to make a big push to get their version on track. The team's technical director Sam Michael said: "You can imagine it's a bit complicated to keep something still while everything around it is moving. "We had problems with it before we could take it to a race. So we had a revised design at Barcelona (testing last month)." Remember that the only possible justification for these things is the brake cooling excuse. Never mind that there is nothing wrong with existing arrangements for cooling the brakes and none of the teams have experienced problems in that area. The thing is only worth doing because it gives an appreciable aerodynamic advantage - and that means more time and money spent on designing something that is unneccessary, irrelevant to road use and ugly to boot - and because everyone else is doing it. It is not even as if there were anything new about wheel fairings either. Le Mans cars have used them for decades, except that they turn with the wheel since there is no need to hide their aerodynamic intent. Does the FIA seriously expect that road cars will be designed in future with non-rotating wheel inserts? Clearly, this is yet another blind alley of development that the FIA allows for political reasons while banning genuine advances in technology on spurious and illogical grounds. Max can talk about his brave new world of F1 until he is blue in the face but it means nothing while he continues to ignore counter-productive developments when it does not suit him that they be brought into line with his stated agenda. Not that his agenda remains constant, of course. Where now are the smaller turbo-charged engines running on bio-fuels that he was talking about less than a year ago? That was a stupid idea too but at least it made more sense than continuing for ten years with the gas guzzlers of the present. And if he thinks KERS (Kinetic Energy Recovery Systems) will make up for continuing to burn fossil fuels, he really doesn't know the environmental movement at all. "Does the FIA seriously expect that road cars will be designed in future with non-rotating wheel inserts?" Actually, a car show on TV last night said the coming model from Rolls Royce will have something like that. Not to help with brake cooling or aerodynamics of course, but to show off the flashy RR emblems. "No wonder they call him Mad Max... "
"MadMax" ...... you've been reading my comments! My personal handle for that idiot! 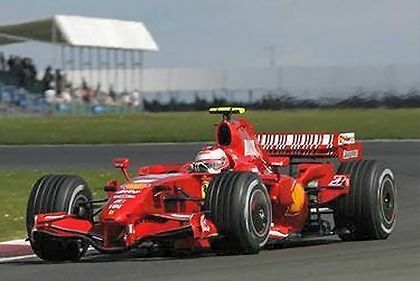 Sure Ferrari, you can run those wheel wells, there are no foreseeable issues there. McLaren is the reason this sport is going down the drain, just fine them, nothing will come of that. How about we return to running slicks with out TC? Hmm.... How about we freeze development of anything meaningful along with that? *POW * - thats better. That sounds like Max, all right! "But we all know that their primary function is aerodynamic"
toyota may not use them as brake cooling, but that has no bearing on how ferrari use them. if the 'special gas' rumour is fact, then the aero benefits may be less than any cooling advantage. Actually, it matters not whether Ferrari genuinely use the inserts primarily for brake cooling, Sidey. There can be no doubt that they do have an aerodynamic effect in addition to any other intended purpose and, by previous FIA decisions, that is sufficient to ban them. The mass dampers, for instance, were primarily for controlling suspension movement more accurately and any aerodynamic effect was secondary (as well as extremely far-fetched) - yet aerodynamics was the reason given for the FIA ban. It was CO2, as it turned out. Hmmm. Maybe we should think of it as functional kinetic art? Or they can slap some neon on the wheel nut and just pimp that ride. I particularly like how this is addresses "the problem of open wheels". Okay, it was just a bad choice of words but yeah, why did they allow it when it was apparent this was not just an expensive aerodynamic hubcap? Which is exactly what I thought it was before now. I should have known better when it first appeared on a Ferrari. He loves to meddle old Max eh? Sometimes he infuriates me but a lot of the time he does get it spot on, despite his tendancy to over-play his role. Oh well, you've got to love him! "It was CO2, as it turned out." "I fail to see how that has any bearing on brake cooling"
the special gas may have allowed the rim and the fairings to act as a cooling duct. depends if you think the gas was just CO2 though, of course. Interesting, Sidey. Not sure how I managed to miss that particular article of yours. I see now how use of the gas could require extra cooling for the wheel rims, provided that the Racecar Engineering article is correct, of course. It seems a bit strange that the magazine is alone in this assertion, everyone else agreeing that it was CO2. In fact, the explanation as wheel rim cooling rather than brake cooling does not make a lot of sense. For transference of heat from the wheel rim to the insert it would be best for there to be direct contact between the two components - so why the need to keep the insert static and therefore separate from the rim? There are simpler and more efficient ways of cooling the rim. Not that it matters when considering the legality of the wheel inserts, however. They have an undeniable aerodynamic benefit, regardless of any other intent and, as such, should have been banned by the FIA from the outset. "The F1 race engine is fully developed, there is no need to develop it any further"
1) Teams would not bother to develop the engines and the manufacturers would probably stop doing engines. 2) Nobody would care if Max was freezing the engines for ten years, since they could not develop naturally anyway. 3) Max would not need KERS, since presumably the ideal method of propelling an F1 car given its surrounding circumstances would already be implemented, and if KERS was part of that it would already be on the engines in its optimum form. 4) The environmentalists would not complain about F1 cars (apart from the small minority of environment extremists), since they would already be as environmental as their function allowed. 5) We wouldn't be impressed with Max (because of reason 2), but we wouldn't think he was a total fool on the matter either. Oh, and the comment reminds me of the person who ran the Patents Office in Switzerland in 1899, who said "Everything that can be invented already has?" Wouldn't he be amazed if he could see the world today - and wouldn't Max be amazed if he saw F1 engines in 2115? "everyone else agreeing that it was CO2"
no idea what research everyone else did, but racecar seem to have the data to back up their argument. worth a look if you can find the magazine. "so why the need to keep the insert static and therefore separate from the rim"
the rear fairings are not static, so they use the most efficient method of cooling. however, heat expelled from the front brakes needs to be accurately controlled (otherwise it would pass over bodywork). i agree that the front fairings have an "aerodynamic benefit", but your initial statement that "their primary function is aerodynamic", isn't strictly correct. which was the point of my original comment. "I didn't mind the inserts so much until Ferrari decided it needed to paint fake wheel spokes." dan, couldn't agree more. next they'll be painting headlights on the front so that the cars are more "road relevant". And I stand by my original statement, Sidey. Even accepting Racecar's gaseous revelations, the plain fact is that wheel inserts reduce drag considerably, whereas any benefit gained by reducing graining in the tyres is a marginal advantage at best. That's why the things have migrated to the front wheels too - their biggest gain is in aerodynamics and, regardless of why Ferrari introduced them in the first place, that is the route being followed now. What amazes me most about Max's statements, Alianora, is the people sit there and listen without really thinking about what he's saying. The ten year engine freeze is a punitive measure against the engine manufacturers for daring to come up with suggestions for the way forward that were not in line with his own ideas. He is merely demonstrating his power and any explanation he gives for the freeze is pure nonsense. Maybe Max thought that the businesspeople in the conference were stupid... ...but then he seems to think that of everyone else too.